Happy New Year! 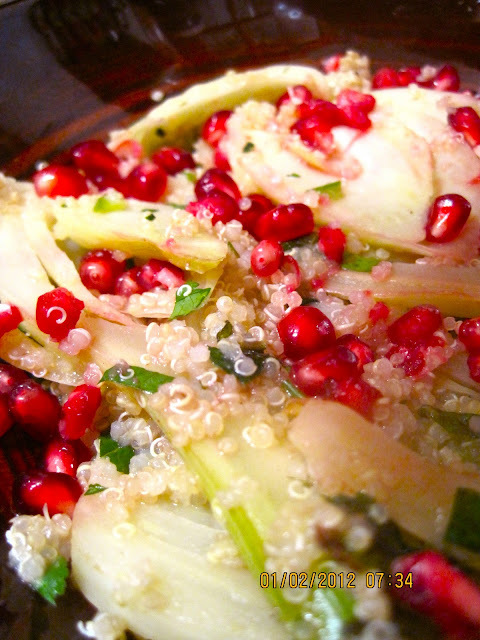 I apologize for the lag in posts (re: Jews going away for the holidays, above) but I'm back in action and excited to share with you this appropriately-labeled "fresh start" recipe from Bon Appetit: Quinoa, Fennel, and Pomegranate Salad. 2012 is all about superfoods- fine, I made that up, but a collective push for consuming the most nutritious fruits and vegetables is certainly trending so why not?- and the all-star ingredients of this salad are listed in the recipe name. The flavors merge in the most interesting way- the sweetness of the pomegranate jewels, tartness of the lemon segments, and refreshing bite of mint and fennel all come together... while forming the ultimate crunch. Subtle hints of dill and cilantro, serrano chile and cumin give a nice kick to the earthy quinoa base. I also loved the texture and shape of the fennel- by slicing it thinly but keeping the bulb intact at the base, the lightly sauteed segments fan out like tentacles in the salad, similar to a calamari steak. Generously dotted with the magenta seeds, it looks really beautiful too. 1. Heat 1/8 cup oil in a large skillet over medium heat. Add fennel; season with salt and pepper. Cook, stirring occasionally, until fennel is just tender and lightly golden, 10–12 minutes. Stir in lemon juice, cumin, and sugar; cook for 1 minute. Season with salt and pepper. Set aside. 2. Meanwhile, bring quinoa and 3 cups water to a boil in a medium saucepan. Cover, reduce heat to low, and simmer until quinoa is cooked, about 10 minutes. Drain; return to pan. Cover; let sit for 15 minutes. Fluff with a fork; transfer to a large bowl. 3. Using a small sharp knife, cut all peel and white pith from lemon. Cut between membranes to release segments; discard membranes and roughly chop. Add lemon with any juices and remaining 1 Tbsp. oil to quinoa; stir. Add fennel mixture, chile, and herbs. Toss gently to incorporate. Season with salt and pepper. Transfer salad to a platter; sprinkle with pomegranate seeds.